A peshmerga checkpoint stands beside pools of oil with damaged oil pipeline infrastructure, as Iraqi Kurdish forces push the frontline forward against ISIS forces 20 miles southwest of Kirkuk, Iraq, on 13 March 2015.These peshmerga units of the Patriotic Union of Kurdistan (PUK) faction have made significant gains against villages held by ISIS, in concert with an Iraqi government and Shiite militia attack further south to free Tikrit from ISIS control. Hana Habshi adjusts the irrigation pipes in his apple orchard in Deir El Ahmar. 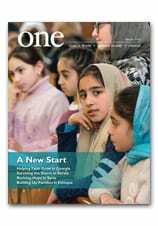 Learn more in “Springs of Hope in Lebanon” from the January 2012 edition of ONE.